Many a time we hear classical concertos we get recordings with gaps between the accompaniment orchestra and the soloist. Although for the audience the focus is on the soloist, a good supporting orchestra will bring balance and completeness to the performance and the recording. Beethoven violin concerto is a classical work I am very familiar with. Although it is a violin concerto, Beethoven did not compose this piece in a way to shine the solo instrument alone. In fact, and especially in the first movement, there is a good balance between the solo instrument and the supporting orchestra. The exchanging of musical ideas to and fro between the soloist and the orchestra is one of the main characteristic of this great concerto of Beethoven. I was thinking one day that for a recording of Beethoven violin concerto, if too much emphasis was placed on the solo instrument, the recording effect for this composition actually might end up less convincing. 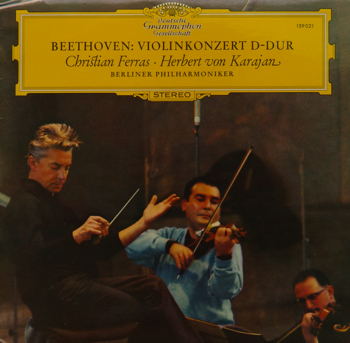 Therefore I took out the Beethoven violin concerto recording by Christian Ferras and Karajan, with Berlin Philharmonic. We all know Karajan is a great conductor with great style. But he is also a great supporting conductor for solo instruments. His careful interpretation of the musical structure created very convincing presentation and sparks between the orchestra and the solo instrument. Ferras and Karajan chose a broad and slow tempo for the concerto. This interpretation is a great contrast from Heifetz’s interpretation, where he used a very fast tempo. Heifetz’s recording paid too much attention to the solo violin, thus could not present the orchestra part in a balance way. 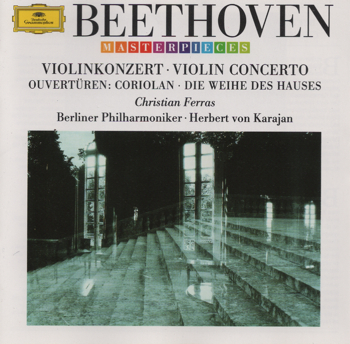 Ferras’ recording, on the other hand, created a grand sound stage and a great feeling due to the slower tempo and the balance recording for both the solo violin and the orchestra. My only complaint on Ferras’ recording is his last movement too slow to my taste. A faster tempo for the Rondo would certainly brought more life and fire to the movement. However, the last two concluding chords are so forceful and confident, and is certainly a satisfy and memorable one.